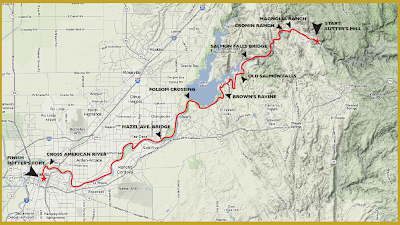 Tahoe Truckee Outdoor: Inaugural Gold Rush trail run in 2013. Inaugural Gold Rush trail run in 2013. The Gold Rush 100K is a point to point race that begins at Sutter’s Mill in Coloma and ends at Sutter’s Fort in Downtown Sacramento. The date is May 11, 2013. 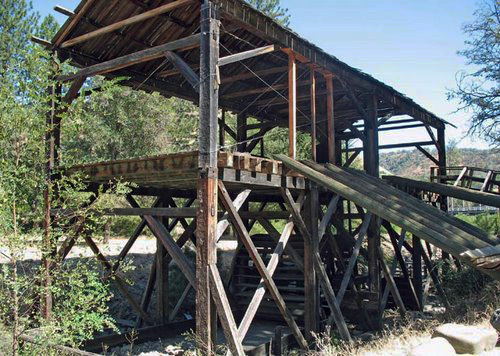 History buffs may recall that the California Gold Rush began at Sutter’s Mill in Coloma. The mill’s builder, James Marshall, discovered gold at the mill in 1848. Gold from Coloma and the surrounding area was taken to Sutter’s Fort in Sacramento for safe keeping. The Gold Rush course is described as “very fast”, using 90% dirt paths and having a net loss of more than 700 feet. Aid and fluid stations will be approximately every 5 miles. Pacers will be allowed from the Hazel Avenue Bridge to the finish. The Sutter’s Fort State Historic Park is pleased to be part of the event. Park officials look forward to seeing family, friends, and runners at the Gold Rush finish line. 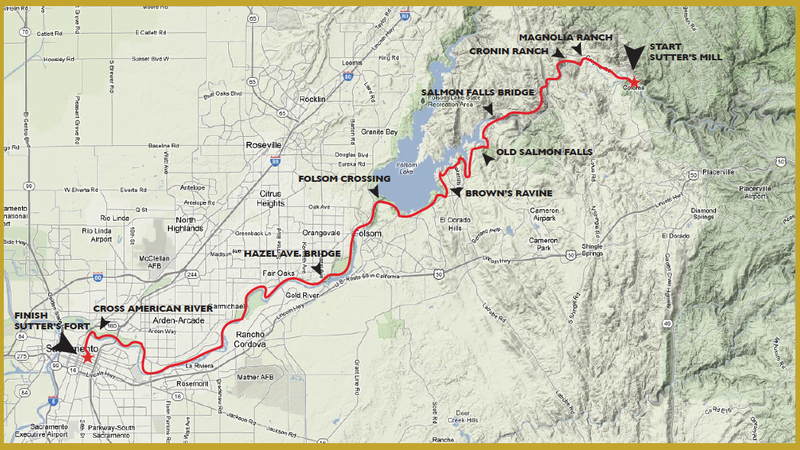 The Gold Rush 100K is put on by the Sacramento Running Association (SRA). SRA puts on the California International Marathon, Lake Natoma Four Bridges Half Marathon, Sactown Ten, and Super Bowl Sunday 10K. If you are interested in volunteering, contact the Race Director, Bill Hambrick at: rdBillHambrick@yahoo.com Hambrick is a long-time ultra runner with plenty of experience and knowledge of what it takes to produce a quality event. Click to enlarge course map.